As scores rocketed into the 80s and even the 90s at the storied Co Clare links — only five players broke par — the 22-year old wielded his putter like a wand and came back from four over after just three holes to card a two under 70 worth a share of top spot with New Forest’s Dessie Morgan. On a day when 50-year old veteran Eddie Power shot a 72 and his 16 year old son Kevin posted a three over 75 to sit comfortably inside the top 64 who will progress to Friday morning’s first round of matchplay, Geraghty needed all his putting magic to conquer a 20mph southwest wind, slick greens and some challenging pin positions. Four over after a bogey at the par-five second and a triple bogey seven off a poor drive at the third, Geraghty was out in two over 38 after following a birdie four at the Klondyke (4th) and a bogey four at the Dell (5th) with birdies from 35 feet at the eighth and a foot at the ninth. He then caught fire on the way home and after a fine four at the 10th, he saved par from 20 feet at the 11th, got up and down from a fairway bunker from 40 yards for birdie at the 12th and then holed birdie putts from 20 feet at the 14th, 25 feet at the 17th and a 10 feet at the 18th. Morgan (34) dropped just one shot at the 16th, where he was bunkered, as he posted a 70 in his first appearance in the South since 2008. They lead by one stoke from Royal Dublin’s Shaun Carter, Carton House’s Keith Egan and Newcastle West’s Andrew McCormack but while most of the fancied contenders avoided disaster, there were some struggles. American Ben Corfee birdied four of the first five holes but a quadruple bogey eight at the sixth crushed his dreams of a great score and he came home in 42 for a 78 that left him alongside Rowan Lester with international Richard Bridges a shot further back after a 79. Morgan, who is now the general manager at New Forest Golf Club after a lifetime playing out of Mullingar, was massively surprised by what he found on his first appearance in the South for seven years. “I haven’t played at Lahinch since 2008 and even the colour of the clubhouse has been transformed,” he said, referring to the changes carried out since General Manager Paddy Keane came on board at the end of 2011. Morgan, now 34, has yet to win a championship. 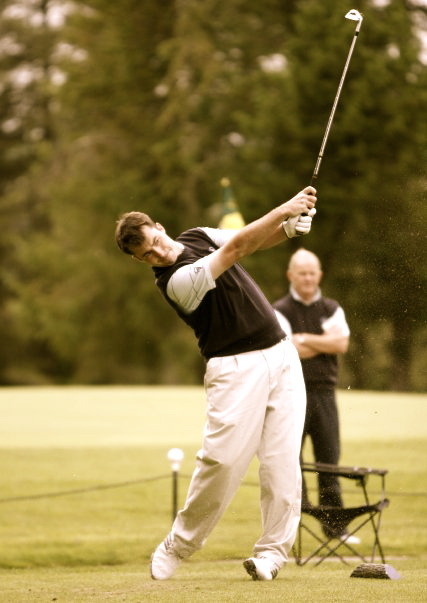 But three Top-3s in the East and runs to the quarter-finals in North and South and to the final of the West in 2008, where he lost to Shane Lowry, are a testament to the quality of his game. “I wouldn’t go to the championships if I didn’t feel I could win or at least compete but it’s also a great chance to catch up with old friends too,” he said after making three birdies and just one bogey. Justin Kehoe shot a 76 on his return to the South after a 12-year absence, confessing that he had to dig deep and scramble on the way home having been three over early following a bad bounce off a sprinkler at the second and a double bogey at the third. The top 64 were on six over 78 or better which leaves Lester (78), Bridges (79), Barry Anderson (79), Alan Lowry (79), Gary McDermott (79), Niall Gorey (80) and Conor O'Rourke (81) with work to do. In other Lahinch news, Faithlegg's Robin Dawson, one of the pre-tournament favourites, was forced to withdraw before the start with tonsilitis. Keith Egan proved that his brother Tom is not the only dangerous fighter in the family when he took out veteran Pat Murray with a brilliant birdie at the 23rd to reach the semi-finals of the South of Ireland Amateur Open at Lahinch. Paul McBride was inspired by Paul Dunne’s “ unbelievable” Open Championship performance as he headed the qualifiers for the South of Ireland Amateur Open at pristine Lahinch. Mullingar’s Dessie Morgan made the perfect start in his bid for a maiden championship victory when he opened with a five under par 67 to lead after the first round of the East of Ireland Amateur Open at County Louth.